Shipping Regions are a feature in AmeriCommerce Online Stores that give store owners the ability to specify an area of countries, states or zip-codes in order to apply different shipping rules and costs to different geographic locations. Do you charge a different shipping rate for Alaska and Hawaii? Do you ship only within the U.K.? Or maybe you only ship to Texas and Louisiana? Shipping regions make all this possible. In this example, we're going to setup shipping regions for a fictional brewing company based in Beaumont, Texas. The brewing company delivers to customers in Beaumont, offers 15% off shipping for all of Texas, charges regular rates for the lower 48 States, and charges an additional $25 to Alaska and Hawaii. We'll create a shipping region for each of these scenarios. Zip Codes: Leave blank (don't type anything in this box, in other words). States: Select all states but Alaska and Hawaii and the Canadian Provinces. To do this, click on Alabama to select it. Then, scroll down until you see Wyoming. Hold the Shift Key on your keyboard while clicking Wyoming. This will select All 50 states. Now scroll up to Hawaii and hold the Ctrl key (Command for Mac) down while clicking Hawaii -- Hawaii should now be un-selected. Now do the same thing for Alaska. See screenshot below. Priority: If a customer's shipping address is within two regions (For example Texas and Beamont, TX), the region with the highest priority will be used. Region Type: Zip code or Country. Zip code allows you to select a state/province or specify zip codes. Country allows you to select and entire country. Zip Codes: Available when region type is Zip Code. This is where the zip codes can be specified, return separated. States: Available when region type is Zip Code. Select the states that will apply to the region. Do not select any states if using the Zip Code box above. Country for Zip Code Lookup: A Country must be selected here when the Region Type is Zip Code. If no Country is selected here, the region will not function. Markup Type: Use % for a rate of increase and use $ Amount for a flat markup. Default Shipping Warehouse: The warehouse to be used for shipments within the shipping region can be selected here. Leaving Default selected will cause the Product's warehouse to be used. Region Restricted Payment Methods: Check the payment methods you do not want to be available for the region here. Ship Outside of Regions: If checked, customers will be able to place orders that will be shipped outside of your defined Shipping Regions. 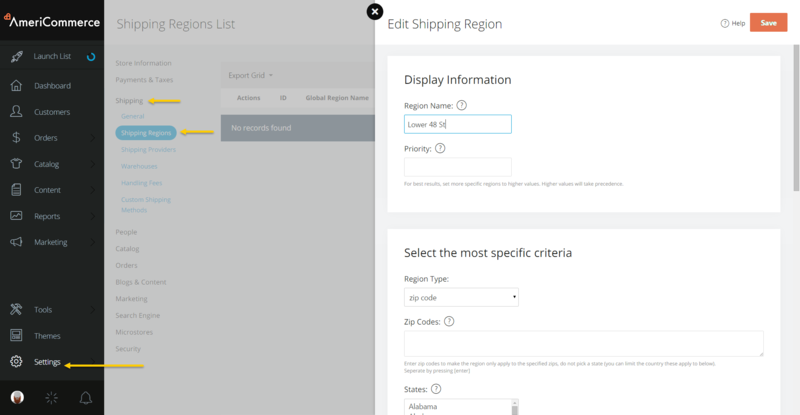 Call for Shipping Outside of Regions: When this is selected, an order with a shipping address outside of the defined regions will be treated as a 'call for shipping'. No shipping will be charged and a custom message can be displayed to the customer in the cart and on the order. Call for Shipping Outside of Region Message: This is the custom message that will be displayed when the Call for Shipping Outside of Regions is selected. No Ship Outside of Regions Message: This is the custom message that will be displayed when the Call for Shipping Outside of Regions is selected. 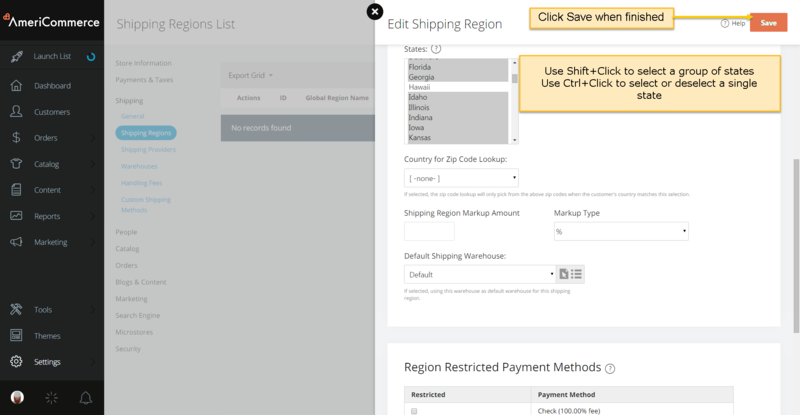 Lastly, store specific Shipping Region Markups can be applied in Settings > Shipping > General in the Region Settings section.